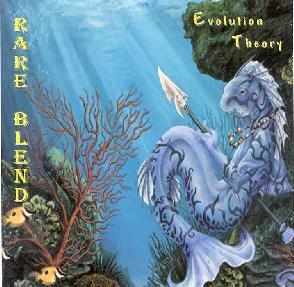 Rare Blend - "Evolution Theory"
I’m not really up on all the different jazz types, but Rare Blend plays the kind of jazz that’s commonly associated with the progressive rock folks. They are a four piece consisting of Vic Samalot (guitars), Bobbi Holt (keys, vocals, didge), Paul Stranahan (drums), and Jeff Scott (bass); Kip Reed fills in on bass on two tracks. As I listen to Rare Blend, I’m reminded that a number of Prog-Rock bands of the seventies had jazz leanings. These jazz leanings tended to appear during the long instrumental passages that are so common in Prog-Rock. That is essentially what Rare Blend sounds like: long melodic instrumental passages. They are definitely a guitar-oriented band. Vic is a great player and the compositions tend to support his guitar lines. The nice thing is that Vic is not stuck with a single guitar sound, so his playing is rich and varied. Bobbi adds a lot on the keys. Lots of nice little fills, as well as some pretty cool lead lines. The rhythm section is both powerful and interesting. Jeff tends to go for the loopy bass line and it’s his playing that gives many of the tracks their drive and movement. The drums I found to be flailing and busy, perfect support for Jeff’s low end and the perfect rhythmic background for Vic and Bobbi. Bobbi sings on the final track. It’s obvious she’s sung before and that she’s real comfortable singing jazz. What’s really interesting is the intricacy of the composition "So Cool". The band really tightens up with the addition of Bobbi’s vocals and has a more focused sound. I love how they inhabit the background when she’s singing and then slide to the fore during the instrumental. I really like this CD. Very melodic and very interesting in a Prog-Rock sense. There is a lot of variety here, while still maintaining a cohesive band signature sound. For more information you can visit the Rare Blend web site at: http://www.rareblend.net. Contact via snail mail c/o Rare Blend; PO Box 609105; Cleveland, OH 44109.